Leonardo and Federico welcome you to the elegant yet cosy noble "Locanda" of Sant' Agostin, situated in a historic sixteenth century Venetian palazzo. Tastefully furnished and restored in 2001, the Locanda offers period furniture and objets d'art, fitted with the most modern facilities for the most discerning of guests. We are located in an important area of cultural and artistic interests just steps from both the Rialto and major transportation areas (railroad station and bus station). Our location is right in the heart of Venice, in a characteristic area, alive with craftsman's shop, artisans, osterie, trattorias and taverns. 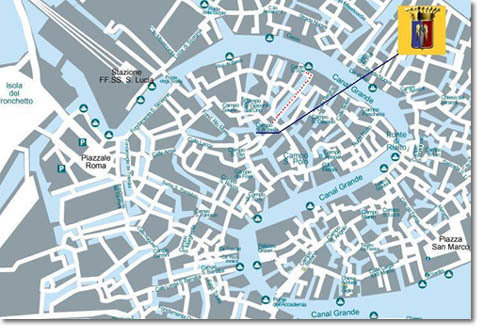 Our Locanda is so well situated that it gives the guests the chance of quick movement to any part of Venice. Our warm hospitality awaits you! From the airport, You can take ACTV bus N° 5 or the ATVO bus to Piazzale Roma ( road terminal). Alternatively you can take a private water taxi directly to the hotel door ( rio di Sant' Agostin). Take ACTV water bus N° 1 (six minutes) to the 3rd stop, "San Stae" and a three minute walk will bring you straight to Campo Sant’Agostin and the Locanda. If you take a private water-taxi, it will bring you right to the hotel entrance. Take the public water bus n° 1 to the fourth stop "San Stae" (about 8 minutes) then a minute walk will bring you straight to Campo Sant’Agostin and the Locanda. If you take a private water-taxi, it will bring you right to the hotel entrance.